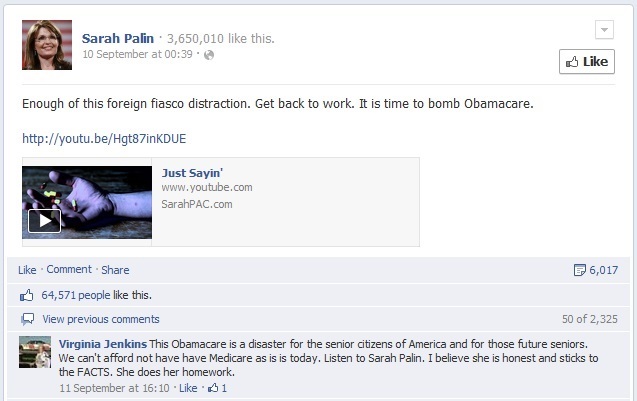 Palin rails against Obamacare in her usual eloquent, measured tones. I comprehensively “refudiated” Sarah Palin’s “death panel” claims on this blog a year ago, as did every other sentient person on the internet, so there is no need to cover this old territory. So where to start with this latest deliberately provocative outburst by the half-term governor from Alaska? Perhaps with the fact that the GOP-led House of Representatives has now voted 40 times to repeal ObamaCare, each time in the full knowledge that the repeal would never pass the Democratic-held Senate, let alone be signed by President Obama. Or maybe the fact that Obamacare (or the Patient Protection and Affordable Care Act, to use the correct title) is President Obama’s signature domestic legislative accomplishment, he campaigned on a platform of health reform in 2008 and won re-election by a significant popular and electoral college majority in 2012 after having brought it to fruition. Nor has the “grassroots tsunami” against the bill, invoked by Senator Rand Paul, materialised in any meaningful way. Polls continue to show the American public divided in support of the word Obamacare itself (a testimony to Republican misinformation and scare tactics), but broadly supportive of the various measures contained within the bill. And so apparently the only recourse left to Palin and her legion of fact-averse followers is to dust off the violent, revolutionary rhetoric as though Obama were King George reincarnate. I make no apology for always assuming the worst about Sarah Palin’s motives, so my theory for this bizarre use of phrasing in her appeal for a popular revolt against Obamacare is that she deliberately used the word “bomb” in the knowledge that the fiftieth anniversary of the 16th Street Baptist Church bombing was fast approaching, hoping to get a rise out of offended liberals who would then accuse her of race-baiting or racial insensitivity, allowing her to play her patented Palin Persecution Card and receive even more unearned air time. If you think that this is a harsh accusation to level against someone, recall that Palin has accused the president of the United States of “palling around with terrorists”, treason and a litany of other crimes and misdemeanors. Accusing Palin of being a sneaky, calculating, insensitive charlatan is pretty mild by comparison. 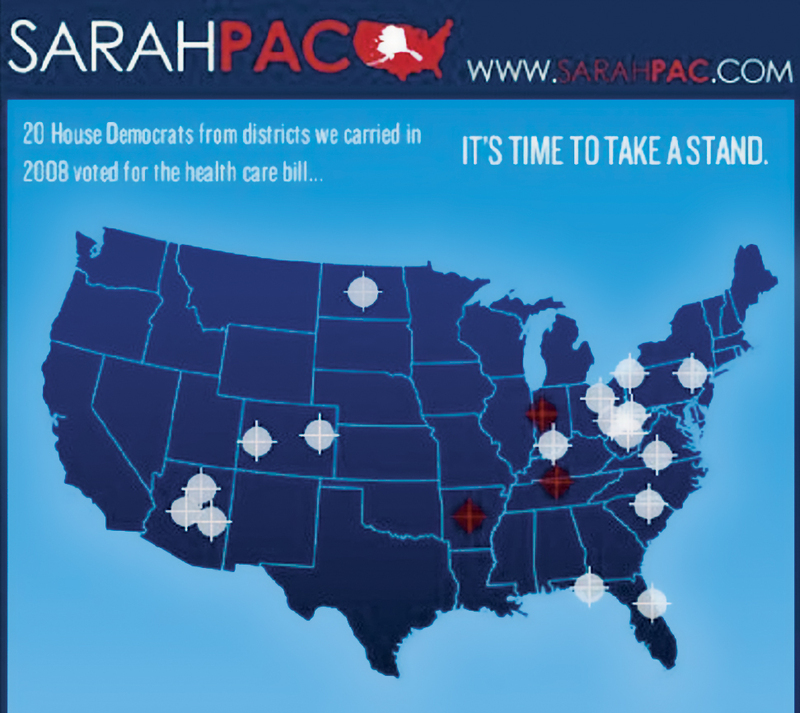 First we had the gun sights over Democratic-held congressional districts that Sarah Palin’s PAC was targeting in the 2010 midterms. Looking at this action in isolation, I can understand and forgive; showing literal targets over parts of the map that Republicans want to target politically does not seem unreasonable or violent to me, and I felt that the left-wing furore and attempts to link the imagery to the Gabrielle Giffords shooting in Arizona were craven and opportunistic. But there is no comparable popular imagery relating to a bomb. We don’t talk about bombing a goal that we want to accomplish in the way that we might talk about targeting a goal or an aspiration. The word “bomb” has connotations only of violence and terrorism. Sarah Palin, of course, does not wish for any literal bombs to be detonated in opposition to Obamacare, and would doubtless be horrified and appalled if one of her supporters were to read her words too literally and actually start blowing things up. But she is quite happy to use a charged, loaded word – a word associated only with war and terrorism – in relation to the US healthcare debate, to ensure that her fading political voice gains more prominence. It doesn’t make Palin a terrorist supporter. But it does reveal her to be a shrewd, conniving, opportunistic and (still) dangerous political presence, willing to say and do almost anything to demonstrate her opposition to President Obama’s policies and legislative accomplishments. Which, of course, we all already knew. My early prediction – barring some amazing or cataclysmic event or development, Republicans will comfortably lose the 2016 presidential election and a number of congressional seats (compared to the total that they hold after the 2014 midterms). I am confident about this because of two intractable characteristics of the current Republican party, and their congressional delegation. These House members, however, worry much more about their own constituents’ opposition to the proposed changes. And they fear a challenge in the next Republican primary if they ignore those concerns. For years, GOP senators have been stingy with the National Republican Senatorial Committee, refusing to make large transfers of money out of their personal campaign accounts that could help their party compete in neck-and-neck races across the country. For 2012, Democratic senators transferred nearly five times more to the Democratic Senatorial Campaign Committee than Republicans gave to the NRSC. And just like last year, an initial look at the Senate map shows a path to the majority. It won’t be easy: Republicans will have to knock off well-financed Democratic incumbents, defend Minority Leader Mitch McConnell and limit the internecine primary warfare that has twice cost them a chance at the majority. Top GOP senators say that’s exactly the point: Not maximizing the NRSC’s operations could be another unforced error. In short, without more money, you’ll still be in the minority. So there you have it. 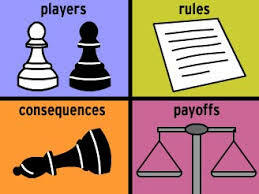 Republican senators sitting on huge campaign war chests and facing the feeblest of Democratic opposition, are much less willing to give some of their surplus funds to colleagues and candidates desperately in need than their Democratic counterparts are on behalf of their own colleagues. Because current Republican orthodoxy tells them that Redistribution Is Always Bad, even if it takes place through the NRSC to further their supposed political objectives at a national level. And Republican house members in heavily gerrymandered districts would rather stay in power and thwart a potential chance to get their party’s hands back on the executive branch of government because, though they all scream that more years of Obama or Democratic rule will spell the end for America, they are more worried still about the danger of a primary challenge from the right if they vote for comprehensive immigration reform. But asked why he hasn’t transferred big bucks out of his massive war chest, Shelby said his donors wouldn’t be happy. Just go ahead and add another four years in the political wilderness to the GOP tab. Take one part Republican politician, add two parts Real Housewives of Wherever, sprinkle some MySpace circa 2003 and then add a whole lot of stupid, and if you are still smiling and nodding, vote Mindy Meyer for New York State Senate. She’s great, because she is against corruption: “I have no experience in corruption … This is how politics has to change. There is always corruption, but I have the intention to follow my values and ensure that none of what happens in my district is corrupt”. See? You can’t lose by betting on this horse. I defy anyone to read Meyer’s policy positions on Stop & Frisk, school choice or abortion and understand whether she is for or against any of them. But hey, after 3 minutes of serious head-scratching thought, “Mindy believes in capital punishment for cop killers”. So there. She needs to go away and go back to work on her fake tan, and leave politics to people who a) understand, b) legitimately care and c) don’t mock people who do A and B.
P.S. If this is just an elaborate prank planned by some organisation or another, then well done, you got me good.